In response to the immigration battle currently raging around the country, six-time Grammy winner Ry Cooder wrote “Quicksand,” a slow-burning rocker that tells the story of six would-be immigrants making their way from Mexico to the Arizona border. The track, which will be released exclusively on iTunes on June 29, features Cooder’s son Joachim on drums, along with backup vocals by Lucina Rodgriguez and Fabiola Trujillo of Mexican roots band Los Cenzontles. Cooder has chosen MALDEF, the Mexican American Legal Defense and Education Fund, to receive all proceeds from sales of the single. Thirst, hunger, injury and fear befalls Cooder’s immigrants during their journey. “Quicksand I think we lost direction,” he laments in the chorus, referring to more than just the song’s protagonists, “I think we’re sinking down.” At the border, a vigilante in a Dodge Ram turns away the song’s only two survivors. “I think you’d take more pity on rescue pit bull dogs,” the narrator pleads before turning around to face his death sentence in the scorching heat of the desert. Your brothers, Coke and Pete, played with Santana; your niece is ’80s pop star Sheila E., and another brother, Javier, formed the seminal punk band the Zeros. And now your son is joining you in the musician ranks. How did music become the Escovedo family business? There was always music in the house. My father was a musician, a singer. It was just part of our daily makeup as a family. Music was always there. There’s also 12 kids. One of the kids was showing another kid a new dance or how to play a rhythm on a drum. Family gatherings were all about music. Several musicians, including yourself, have struggled with health problems made worse by not having health insurance. Why is this such a an issue among musicians? I would first have to say it’s not just musicians. Poor people, old people, people with AIDS, people with cancer -– there’s so many people who cannot find good health care. We should just get over it and have universal health for everyone. It’s obviously harder for a musician. When I was brought down with my illness, whenever I would go to someone for help, there were a lot of people who would refer to this illness as a lifestyle illness, in the same way they did with AIDs. Why should we help this guy because he stayed up too late and drank too much and whatever. Does this say something larger about the status of musicians in our culture? To be a musician in America is to be a person who really doesn’t get any respect for what he does. And yet I think that music and the power of music is so important in our lives. The public recognizes the bigger bands. Yet there’s this whole world of bands that travel in vans and sleep on floors. We’re like Fuller Brush salesman; we just go door to door. Revolutionaries for a New America (lrna.org), was chairing a discussion by veterans of the League (and its predecessors, DRUM and ELRUM). The next thing I knew, Marian had hauled me up to the tables at the front of the room and told me to pull a chair next to Gen. I felt pretty weird, the only white guy on the dais and, I think, the only male in the room wearing a collared shirt with long sleeves. Then again, I was sitting next to people I’d known for a few decades. I just could’t figure out what it looked like. Click here to read more. . . Image from "The Water Front"
consequences were huge water bills and utilities shut-offs. Michigan Welfare Rights Organization (MWRO) spearheaded the fight to preserve the right to clean water, as captured on that film. Marian Kramer was one of the organizers of the US Social Forum and the water issue was prominent in discussions leading up to the Forum. 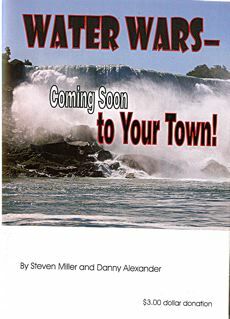 I was delighted to find on our literature table a pamphlet inspired by the Detroit struggle, Water Wars — Coming Soon to Your Town!, written by good friends Steven Miller and Danny Alexander. According to the authors, “Humanity is up against a global system of private property that is doing a really good job of wrecking the world and not much else.” Miller has reported elsewhere extensively on how private property is destroying education; Alexander is intimately familiar with the way the recording industry violates the rights of listeners to and performers of music, in the name of private property. Here they extend their already detailed knowledge to the privatization of our natural resources, something that faces many cities. In Chicago, we have lived with encroachments on our public services, and the mayor is threatening to privatize water, the consequences of which we can predict from this excellent pamphlet, available for $3 from the LRNA web site. 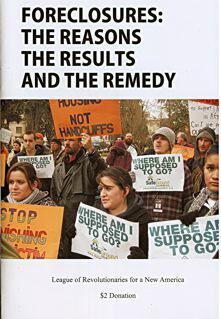 Another LRNA pamphlet on our table that was extremely popular was entitled Foreclosures: The Reasons, The Results, and The Remedy. The authors of this pamphlet are not willing to accept that banks need to be bailed out. They are also acutely aware that nationalizing the banks can simply lead to protection for the banks. 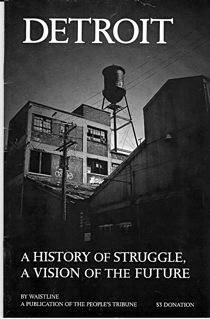 In their words, “The struggle for bank nationalization is therefore inseparable from a struggle to remove our current government which is run by and for corporations and replace it by one that is run by and for the dispossessed who are now the majority of our people.” This pamphlet is available for $2 from the LRNA site. Both Water Wars and Foreclosures include a good list of sources and further readings. Last, but not least, Rally Comrades! (the political paper of the LRNA) produced a selection of articles over the last two years which, taken together, provide an excellent estimate of our current situation. It grounds the concept of revolution not solely as a mental construct, an idea around which people fight (although new ideas play an extremely important role). Instead, On the Edge of History starts with a understanding of a decisive point in the economic revolution that takes place independently of the will of human beings. The editors posit that unlike previous revolutionary periods, the motion of this revolution is toward a cooperative society. It is, however, a motion that capitalism is resisting. The interesting contribution that this pamphlet makes is that just as the existence of the working class is undermined by laborless production, so too is its contradictory pole, the capitalist class. The reorganization of society must take place — but will it be around the distribution of goods and services according to need? Or will fascism reorganize society to protect private property at the expense of the people? This pamphlet is available for $3 from the LRNA site as well. Taken together, this series of pamphlets and materials goes beyond the question of individual or small group defensive, survival patterns which our political system encourages. There is no doubt, for example, that people or communities faced with food that is poisoned or not available will turn to cooperative or individual gardening to help themselves survive. However the key question left unresolved by these defensive measures is related to class, the state, and the rule of the corporations. Whether we are talking about the history of Detroit; foreclosures, housing and the banking crisis; or privatization of public resources, all roads lead in the same direction. If the people do not take over the corporations, then fascism will overtake the people. 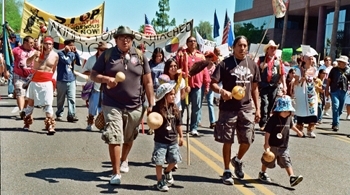 06.28.2010 – The United States Social Forum (USSF) closed Saturday with an inspirational national assembly and closing ceremony. Today, the Forum’s National Planning Committee (NPC) declared the forum a great success with attendance of more than 15,000 people from Detroit, from rural and urban areas across the nation, and from countries across the world including South Africa, Palestine, Honduras and Nepal. Read more here. Henri Cartier-Bresson. Juvisy, France, 1938. The Museum of Modern Art, New York. Gift of the photographer. 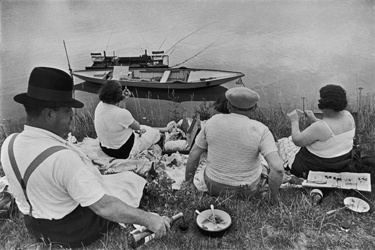 © 2010 Henri Cartier-Bresson / Magnum Photos, courtesy Fondation Henri Cartier-Bresson, Paris. history of photography. His celebrated work of the early 1930s helped to define the artistic potential of modern photography; a decade later, after surviving three years as a prisoner of war, Cartier-Bresson emerged from World War II determined to document a world in the midst of profound change. He did so in 1947 when he joined Robert Capa and others to found the Magnum photo agency, an organization that allowed photojournalists to reach broad audiences through such publications as Life and Paris Match, while still retaining independence and control over their work. more here . The current issue of the People's Tribune asks: "Which Way for America"? Which way for US education? How is it possible to foreclose on . . . the homeless? Isn’t it time to nationalize the energy industries and prosecute the criminals who run them now? These and many other stories can be found in the June People’s Tribune, which focuses on the causes of the 20,000 activists who, at the time of publication, were on their way to the epicenter of the manufacturing rust belt depression, Detroit. The paper not only examines the questions that the growing movements have been posing, but brings out some of their answers as well. Click here to get to the People’s Tribune web site! with his coming and being: hermano!